The Bullmastiff is a trusted family pet and despite its large and fearless appearance he really is just one huge gentle giant. But how do you keep a muscular dog this size healthy? Naturally it starts with their diet. Given their extra-large size (weight averaging from 100-130 pounds) you need to make sure it gets the proper nutrition - no more, no less- since they’re already obviously big in size and prone to gaining weight. In this article, we’re going to talk about the best dog food for Bullmastiffs, along with some things for you to watch out for in order to keep them healthy. If you’re in a hurry check out Taste of the Wild High Prairie - Roasted Venison and Roasted Bison. This is the best dry dog food to feed a Bullmastiff. It's great for supporting healthy joints, optimum coat and skin health, is grain-free and uses premium quality protein-rich meats. Gentle, highly protective, quiet and strong. Bred to be a poacher hunting dog. Hip dysplasia, bloat, hyperthyroidism, skin problems, eye problems, cancer, lymphoma, cardiac disease. Bullmastiffs are large, muscular dogs that make great protectors because of their intimidating appearance and fearlessness. Underneath their appearance though, Bullmastiffs are a lovable breed which make a great addition to any family. Although they are a little bit aloof toward strangers, this breed will be friendly toward their family and people that are familiar to them. Thus early socialization is recommended to prevent and stop﻿﻿ ﻿﻿﻿﻿﻿﻿﻿﻿﻿﻿aggressive behavi﻿﻿﻿﻿﻿﻿﻿﻿o﻿﻿r in your dog! Bullmastiffs are a breed with a long working history, originally being trained to scare off poachers and later used as police and military dogs, service animals, and hunting dogs. Their protectiveness makes them great and loyal guard dogs, but it also means that they need to be trained and exposed to other dogs and various environments early. Bullmastiffs also have a lazy side 🙂 for a large breed, they are pretty content to hang around at home not doing too much! What to feed a Bullmastiff? Both breeders and trainers consider a raw diet the best option for the Bullmastiff. Food manufacturers spend millions in research to study the nutritional needs of dogs and developing premium foods. So if you don’t have the time it takes to spend hours preparing your pet’s food, you should consider a high-quality dog food made with natural ingredients since it serves no advantage over feeding them a home-made diet. Since Bullmastiffs are prone to a few different health conditions and sensitivities, owners should pay close attention to their diet. Stick to a grain-free diet since this breed is susceptible to cancer. A high-quality, grain-free diet free of artificial additives and chemical preservatives is vital for the health of your Bullmastiff. The ideal diet for Bullmastiffs is one that is moderate in high-quality protein. Excess protein with the Bullmastiff has also been known to cause other related health issues. Since the Bullmastiff is prone to gaining weight, it’s best to keep him on a diet that consists of mainly lean protein like turkey, fish or other game protein. Maintain protein levels around 21-25%. Fat is essential since it protects vital organs and is another source of energy. Maintain fat levels around 15%+. Carbohydrates are necessary as it provides energy as well as fiber to help with your dog’s gastrointestinal tract. Avoid foods containing corn, instead look for sweet potatoes, oatmeal and rice as good and healthy sources of complex carbs. Keep carbohydrates around 40-45%. Finally vitamins and minerals are required for the body to carry out essential metabolic processes. So ensure plenty of these! Bottom line, choose a brand that meets your dog’s needs and is priced for your budget and stick to it. Blends like Taste of the Wild, Blue Basics, Merrick Limited Ingredient Diet and Wellness Simple are great options for Bullmastiffs because of their limited, natural ingredients. Protein and healthy fruits and vegetables are the first ingredients in these premium dog food blends, which are specially designed to help dogs with digestive issues and sensitivities. Read our detailed reviews of the best quality foods further below. Bullmastiffs should be fed small meals throughout the day to prevent bloating. Even though it is recommended that large breed dogs get two meals a day, once in the morning and once in the evening, Bullmastiffs are a little different. Owners can choose to go with three small meals a day if they find their dog has sensitivities and this works better for them. If your Bullmastiff is already overweight, feeding them smaller meals multiple times a day will help keep his metabolism up and help burn calories throughout the day. Always use a measuring cup since this breed is prone to gaining weight. To figure out the right amount of food to feed a Bullmastiff, you can consult the feeding information on your chosen dog food and go per your dog’s weight to start. Afterwards, you can adjust it based on your dog’s individual needs and energy levels. Leave their feeding and water bowls on lower ground and not elevated. Since large breeds are prone to dog bloat, recent studies point to lowering food bowls to help with food digestion. Finally, since the Bullmastiff has a square muzzle they have difficulty eating out of a flat bowl so instead use a round bottom bowl. How much food to feed a Bullmastiff? Unlike most other breeds that are similar in size, Bullmastiffs are not particularly energetic. That said they require regular walks but are not allowed to exercise too strenuously given their joint sensitivities or overeat since this can lead to host of health problems for them. A high-quality and concentrated premium dog diet with fresh meat as first ingredient and using either oatmeal, rice or sweet potatoes as the carbohydrate source is strongly recommended. Owners should make sure to feed their Bullmastiff a high-quality diet but watch the amount they are fed, because overfeeding could potentially lead to weight and other health problems. An overweight dog is an unhealthy dog! Start first by finding out what your dog’s ideal weight is and then calculate how many calories he would need at that weight and then just feed him the food at the reduced calories paying attention that their intake reduces in the winter and increases in the summer. An average male Bullmastiff dog weighs between 110- 130 lbs (50-59 kg) while a female Bullmastiff weighs between 90- 110 lbs (41-50 kg). Premium dog food blends can help with more than your Bullmastiffs’ bloating problems. Owners can look for recipes that also have added ingredients like glucosamine and chondroitin to support large dog’s joint health and monounsaturated fats for coat and skin health since this breed suffers from joint problems. Since Bullmastiffs can also suffer from cancer and tumors, putting them on a grain-free dog food that doesn’t contain ingredients like wheat and corn can be beneficial. Buying food with lean meats as the main ingredients along with antioxidants to support immune function is one of the best ways you can ensure you are giving a Bullmastiff the nutrition it needs. By sticking with a premium dog food brand and consulting with your vet for any food or health-related questions, you can give your dog a long and healthy life, and help fight against some of the illnesses that are common in this breed. 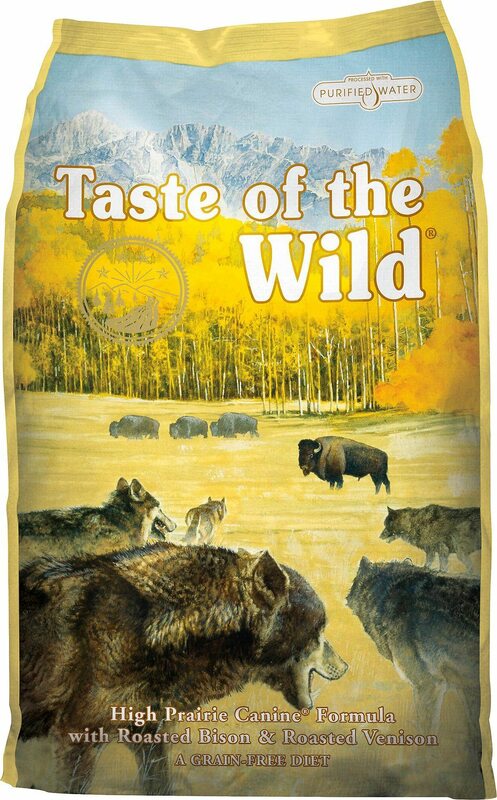 Taste of the Wild High Prairie Canine Formula is a premium grain-free recipe that won’t break the bank. First, let’s take a look at top two ingredients: roasted bison and venison! These are without a doubt top quality meats not found in cheaper dog foods. To increase the protein percentage, chicken and ocean fish meals (great source of Omega fatty acids) are also included. The formula also has high fat, protein, calcium and phosphorus content and can be exclusively fed to your dog. Calories are at 370 kcal/cup. We particularly like that this blend has plenty of fruit and veggies which are not only rich sources of vitamins but also great source of carbs and fiber. This is a highly recommended dog food your Bullmastiff. Aside from roasted Bison & Venison, TOTW offers other yummy recipes owners can choose from or use them to feed on a rotation basis since no single protein source contains all of the required amino acids your dog needs. They are: Pacific Stream (Salmon), Sierra Mountain (Lamb) and Wetlands (Roasted Fowl). This can also help prevent the build up of any food allergies/intolerance in your dog. As this is an adult formula, for Bullmastiff puppies we recommend their High Prairie Puppy Formula which also contains yummy roasted bison and venison. This is excellent nutrition for your growing puppy since it focuses on specific dietary needs for optimal health. Of particular importance is the calcium to phosphorus ratio which is 1.4:1.0 and meets the AAFCO recommendations for large breed puppies. This puppy recipe is also a great choice of quality dry kibble for a pregnant Bullmastiff or a nursing mother. 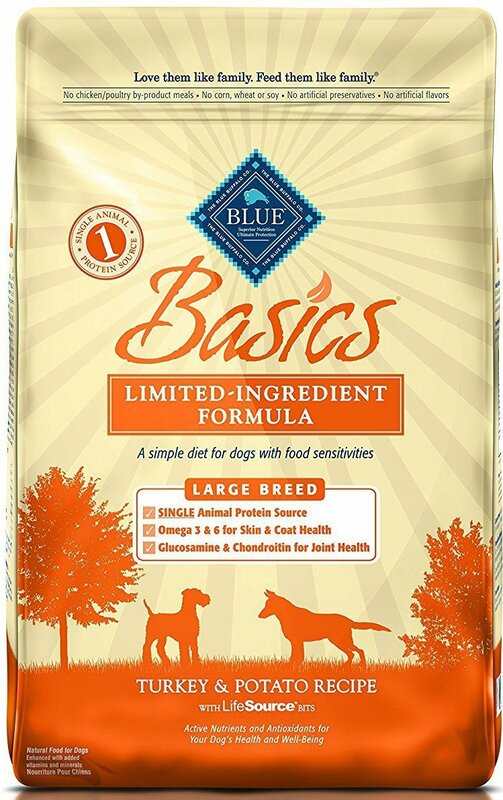 Blue Buffalo Blue Basics Large Breed Adult Turkey & Potato Recipe is a limited ingredient dry dog food formula that is great for dogs with allergies and sensitivities, because it focuses on just a few key ingredients. Blue Buffalo is known for its great holistic blends that focus on dogs’ complete nutrition, and this blend gets its protein from just one source: turkey. The recipe is specifically designed to meet the needs of large dogs, while helping to maintain their weight. The "large breed" mainly means that this blend is lower in calories and for better weight control. Calories are at 368 Kcals/cup. Oatmeal, potatoes, and brown rice are three easily digestible sources of carbohydrates for energy. BLUE Basics is high in Omega 3 and 6 fatty acids, which help give dogs healthy skin and a shiny coat. The recipe also includes chondroitin and glucosamine to support dogs’ joint health - great for Bullmastiffs. A precise blend of fruits, vegetables, and nutrients are included for antioxidants and immune support. Owners love BLUE Basics because it is made in the USA using quality, trusted ingredients. Owners have found that after switching to this great dog formula, dogs suffering from sensitive stomachs, infections, and allergies improved significantly. Another great choice of food for your Bullmastiff dog. Wellness Simple Limited Ingredient Diet Grain-Free Turkey & Potato Formula Dry Dog Food is another great limited ingredient dry dog food choice for your Bullmastiff that won’t trigger allergies, digestion problems, and sensitivities that are common with many other dog food brands. This is a grain-free formula that uses turkey as its only source of high quality protein and potatoes for carbohydrates. 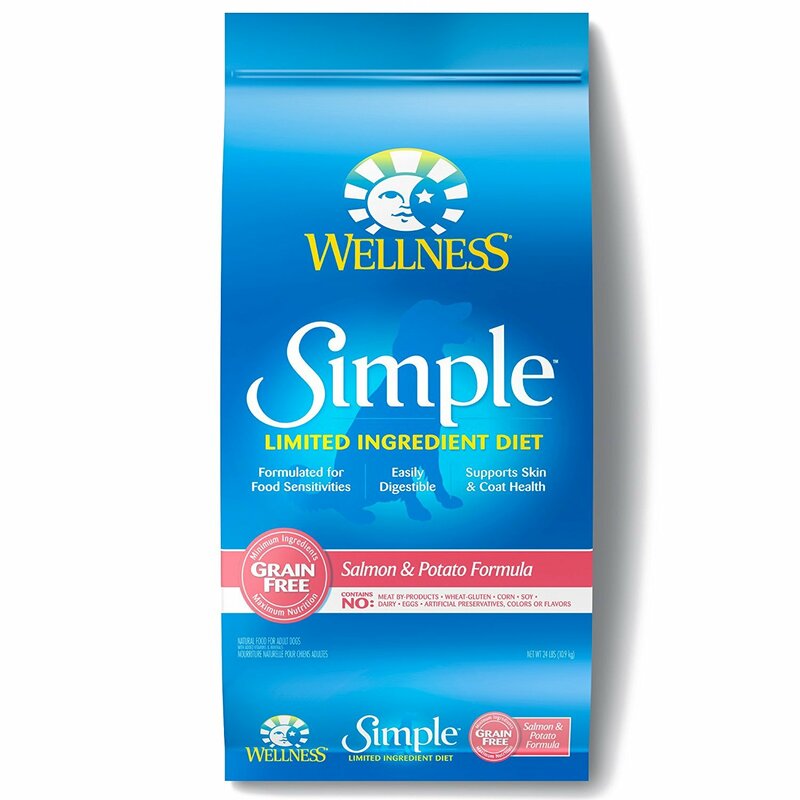 Wellness Simple is a natural dog food that is made specifically to be easily digestible. To support dogs’ skin and coat health, this formula includes flaxseed and canola oil as two sources of healthy Omega fatty acids. It doesn’t contain any meat by-products, wheat, gluten, dairy, egg products, corn, soy, or artificial preservatives, colours, and flavors which what makes this food stand out. Calorie content is a little higher then our first two options and comes in at 430 kcal/cup. Made in the USA and backed by the Wellness Guarantee, this is a trusted brand and known for giving dogs the best possible nutrition. This blend is highly recommended for Bullmastiffs with a food intolerance. Hypoallergenic dog food blends like TOTW, BLUE Basics and Wellness Simple Limited Ingredient are the best for overweight Bullmastiffs with food intolerances. These recipes use lean meats as a high-quality source of protein, are limited in ingredients and are low in calories whilst providing optimum nutrition for your best friend.